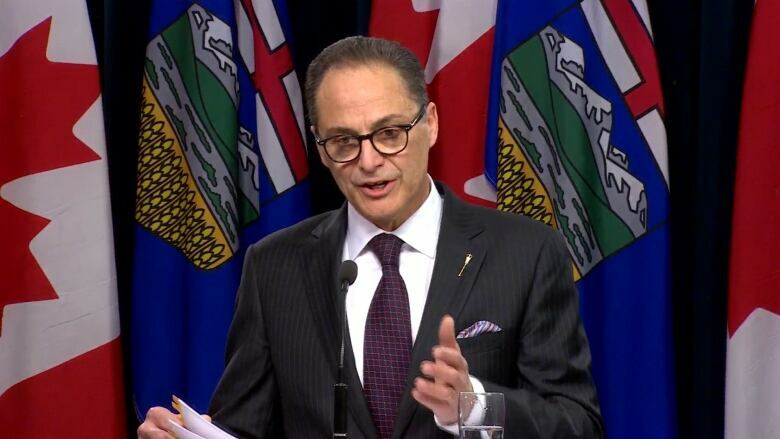 Increases in resource revenue and personal income tax have put Alberta on track to finish the fiscal year with a $6.9-billion deficit, $1.9 billion lower than forecast. The NDP government's third-quarter fiscal update, released Wednesday, contains a strong indication that Albertans will not see a budget prior to the spring election. It includes an update on the government's "path to balance" by 2023-24, a feature never before included in a quarterly update. Finance Minister Joe Ceci deflected reporters' questions about the timing of the 2019-20 budget. "I am preparing a budget. It's the premier's decision when the writ is dropped," he said. "But there will be a Budget 2019." Ceci said he directed his officials to include the path-to-balance update in the quarterly update. He rejected a suggestion the document was political. "I thought it was important to remind Albertans that we are on a path to balance," he said. "There has been a great deal of volatility in this province. So I wanted to remind Albertans that we are on that path without harming programs and services that they rely on." The election is expected to be held within the legislated period of March 1 and May 31. The third-quarter update covers October, November and December 2018. The United Conservative Party was critical of Ceci's projection of a balanced budget by 2023-24, which he first laid out in Budget 2018. UCP finance critic Drew Barnes said this is the fourth time Ceci has moved the balance date. "I'm afraid his promise of a path to balance is not worth the paper it's written on," Barnes said Wednesday. "The NDP's promises couldn't be further from the truth. This is a spend-heavy NDP government that is endangering the future of Alberta, our economy and our next generation." As for the timing of the budget, UCP house leader Jason Nixon said he doesn't want a spring session. He wants the premier to call the election. The difference in the price of Western Canadian Select oil against the baseline West Texas Intermediate Crude widened to nearly $50 US a barrel in late October, prompting Premier Rachel Notley to impose mandatory production cuts that went into effect Jan. 1. Despite that setback, the average WTI price for the entire 2018-19 fiscal year is forecast at $62 US, $3 more than predicted in the March 2018 budget. The average differential for 2018-19 is predicted to be $23.50 a barrel. Revenues are up $1.8 billion. Bitumen royalties are $1.6 billion higher than forecast and the government collected $750 million more in personal income taxes. However, corporate income taxes are still down — the government took in $463 million less than expected. The government also removed $500 million it had added to the budget as a hedge against lower-than-forecast oil prices. The government has borrowed $2.2 billion less than anticipated to fulfil its obligations under the capital plan. That means debt servicing costs are $46 million lower than forecast. The government still projects Alberta to move to a surplus by 2023-24 with a net debt of $56.1 billion and a net debt-to-GDP ratio of 13 per cent. Cannabis was legalized by the federal government during the third quarter, so revenue from sales were reflected for the first time in a quarterly update. The government is projected to take $30 million from marijuana taxes in the period from Oct. 17 to the end of March. The original projection was $26 million. Operating expenses are $221 million higher than forecast. Some notable spending included $30 million on advocacy to swing public opinion in favour of the Trans Mountain Pipeline expansion. Justice and Solicitor General spent $34 million more than forecast in the budget due to increases to legal aid, victims of crime and the rural crime reduction strategy. Other spending items included money to help municipalities with the cost of cannabis legalization, the Lubicon Lake First Nation settlement and indexation and caseload increases for social programs. Alberta Finance has borrowed an additional $6.3 billion for next year's expenses due to the uncertainty over when the budget will be tabled. The money has been put in the province's contingency account.